The Pre-Built Dashboard Pack includes three complete, fully working, dashboards. 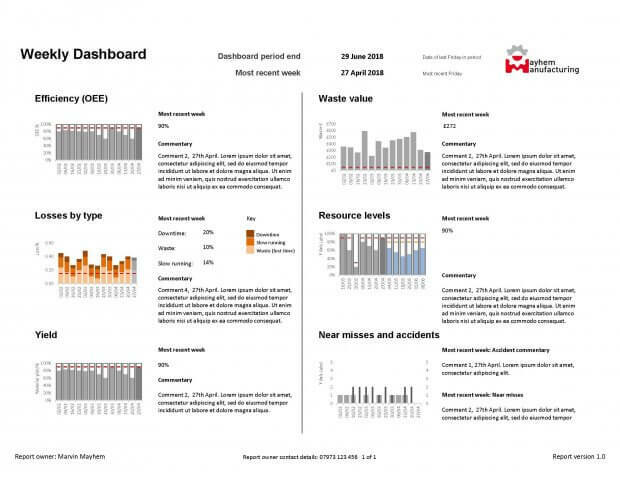 The dashboards have been built using the Brilliant Excel Dashboards System and you are free to modify and alter them however you see fit (but not resell the originals or modified versions). Roughshod Repairs run a small contact centre and like to have a daily operational dashboard to tell them how they are coping and to review expected volumes for the coming days. Mayhem manufacturing have a weekly operations meeting. This dashboard provides all essential discussion points for that meeting. The Cat Herding Society, an independent charity, have built a monthly dashboard to review donations, fund-raising performance and costs.